Beautiful Mastercraft brass table with Greek key embelishments. 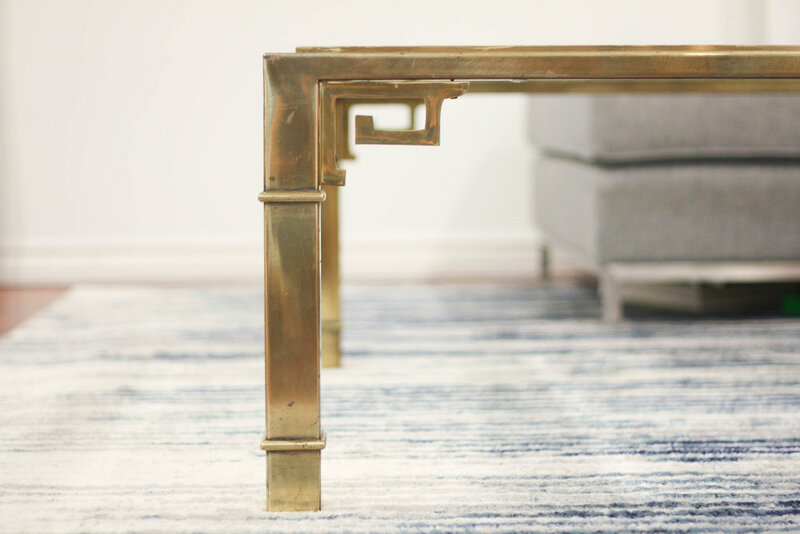 The table is in overall good vintage condition with patina and imperfections to the brass as seen in the photos and is common with all vintage Mastercraft pieces. If you felt so inclined, you could have it replated for a minimal cost and have a brand new table for a fraction of the cost of the others for sale online. There are two chips in the glass at the corners, but they are nearly invisible as they are located in the corner and a brass rail that rests underneath obscures them. You likely would have never noticed had we not disclosed. Rock solid structurally and has the perfect, hollywood regency, high end look that can only come from a Mastercraft piece. The table measures 42" per side and 17" tall.